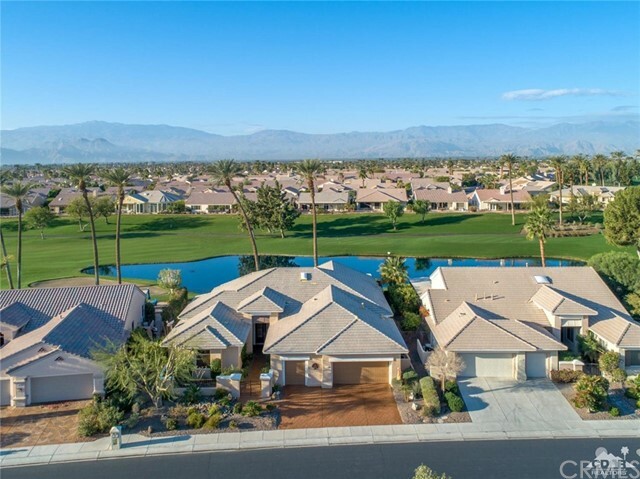 All Sun City homes currently listed for sale in Palm Desert as of 04/21/2019 are shown below. You can change the search criteria at any time by pressing the 'Change Search' button below. "Location! Location! Location! PREMIUM location! Situated on the 18th green of the San Gorgonio golf course overlooking the breath-taking waterfall & lake of Sunset View Clubhouse! Amenities like pool, bocce ball, restaurant are just steps away! This Portofino has newer custom picture windows to enjoy the mesmerizing views! Double doors open to great room w/fireplace & views! Custom den offers a cozy atmosphere for reading, gatherings or TV time. Bright & open kitchen w/VIEWS, island, upgraded cabinetry w/pull outs, walk-in pantry. This home has custom walls & ceiling heights in various locations for a warm ambiance. Master suite w/ built-ins & step up that allows for views, door that leads to back patio. Master bath w/ tub, dual vanity, built-in cabinet, extended walk-in closets & retreat w/closet. On opposite side of the home 2 en-suites, one of which is extended! Indoor laundry, 2 car + golf cart garage. Newer water heater. Some furniture available outside of escrow." "Sun City Palm Desert- Provence. 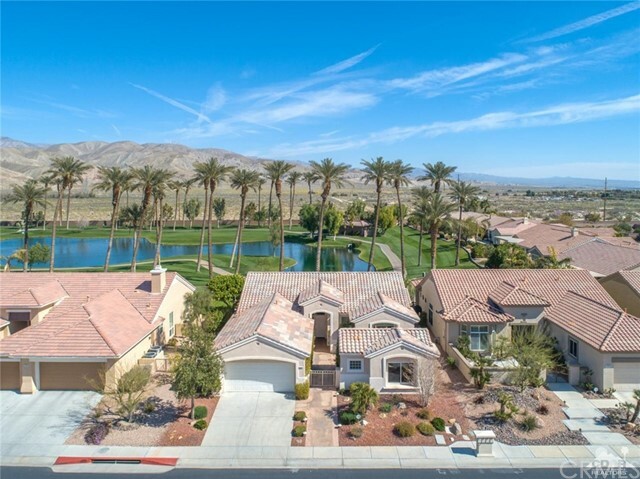 This beautifully upgraded estate model sits above a fairway lake w/panoramic golf course & mountain view. The south facing rear yard features a saltwater pebbletec pool, BBQ & electric shades. Stamped concrete, professional landscaping & glass doors provide curb appeal. Inside, diagonally laid travertine is used extensively. The living room features a dramatic semi-circle of 10ft windows overlooking the pool, lake & golf course. Solar shades on view windows; shutters on others. The family room features a floor-to-ceiling stacked stone fireplace. The kitchen features a Subzero refrigerator & freezer, granite counters, upgraded cabinets w/pullout shelves. The master suite has a large walkin closet w/builtins & a spa like bathroom w/stone surfaces. Spacious guest suite w/walkin closet. Large den/office can be a 3rd bedroom. Dual AC with electronic air filtration, recirculating hot water & central vac. Furniture available outside of escrow." 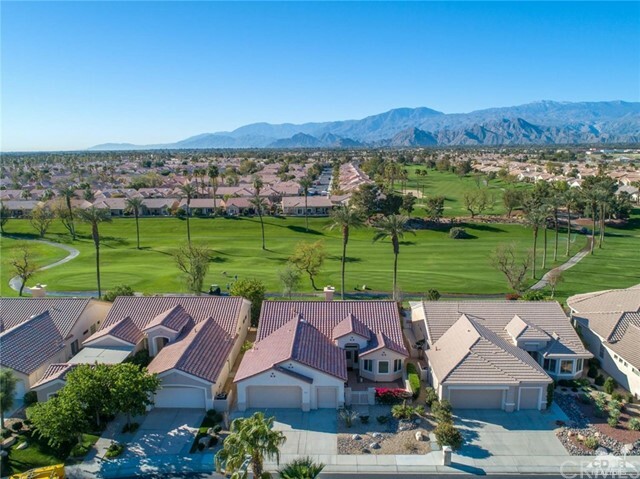 "Sun City Palm Desert Portofino Floor Plan on golf course with unobstructed views of Coachella Preserve and Mountains. Low maintenance Salt Water Pool and Spa (2014) with tanning shelf and extended patio with Alumawood cover can be accessed from the family area and master bedroom. Great curb appeal with newly painted exterior, upgraded stone facia, and decorative concrete driveway. Inside is a dual fireplace separating the family room and living room with a large central formal dining room. The chef's dream kitchen has a center island breakfast nook, ample storage, walk-in pantry, and recently upgraded dishwasher. Extensive windows in the family area and kitchen have automatic shades to enhance your environment. This floor plan offers two bedroom with adjoining baths on one side of the home plus a rare large expanded master suite with private retreat or; office on the opposite side for privacy. AC units replaced in 2018 and all windows and patio doors were upgraded in 2015." 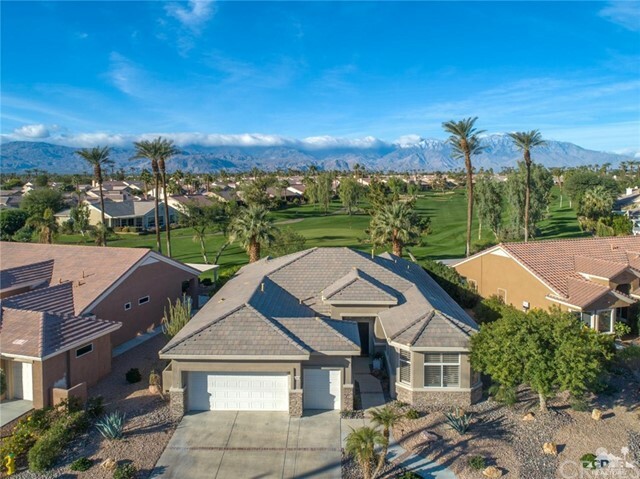 "Sun City Palm Desert - Stunning, renovated San Remo model, in the most beautiful setting, situated on the top of a knoll next to a Lake, Golf Course and has views of the Chocolate Mountains. This home has an updated salt water pool and spa newly resurfaced with quartzscape and cobalt blue tiles, along with a pool fountain and pool solar heater panels. Drive into the extra long driveway and in your garage has a Fujitsu Air Conditioner. The interior hosts cool stamped concrete floors, with beautiful white Hunter Douglas window shutters. Kitchen has granite counters and back splash with window views of the mountains in an amazing Open Floor Plan. This could be your Forever House! Easy to show, so please call and don't miss this beautiful home!" "This renovated Regent Portofino Estate model top of the line is a SHOWPLACE. It is turn-key move-in with exquisite furniture and art that is available outside of escrow. The elevated views of the golf course, the snow capped mountains,and lake are exceptional and seen from all public rooms and master bedroom. Top of the line kitchen with stone counter tops, 12' ceilings, fireplace, large walk-in closets retreat exercise room or office, and water feature in sensational back-yard make this a one of a kind home. It is truly a WINNER. Bring your most discriminating of buyers!" "Priced to sell! Largest floor plan in Sun City featuring stunning views and soaring ceilings throughout. Enter through the foyer where you are greeted by a stunning wall of windows with beautiful golf course views. Huge master suite has beautiful built ins with fireplace, double vanity in bath and huge walk in closet. Bonus room currently used as office could easily double as third bedroom. Enjoy this entertainers kitchen complete with double oven, wine fridge, massive center island/breakfast bar and plenty of cabinet space. Top it all off with the spacious patio boasting views from every angle. Schedule a showing today, you won't be disappointed!" "$50,000-$100,000 less than recently sold Marseille models. Entering the property through double doors you know this is the epitome of desert life-style.A dramatic entry courtyard w waterfall and jetted, heated spool delights.An oversized, detached, ensuite casita is unique. 2 ensuite, master bedrooms'' are in the main house. Once inside the open concept is employed with flair. There is an amazing, eat-in kitchen, a large dining room,office with built-ins. The large, great room has a fireplace and builtins. There is a unique special room not counted in the sf. In addition to the courtyard there is a rear patio and SURPRISE a huge side yard w putting green and lots of more room. All main rooms view at least one of the outdoor living spaces. French doors from the bedrooms to the courtyard add a bit of decadence for easy access to that late night dip. You may never have the opportunity to purchase this much-desired model at this low price again." "Price Reduction! Seller is ready to make a deal. 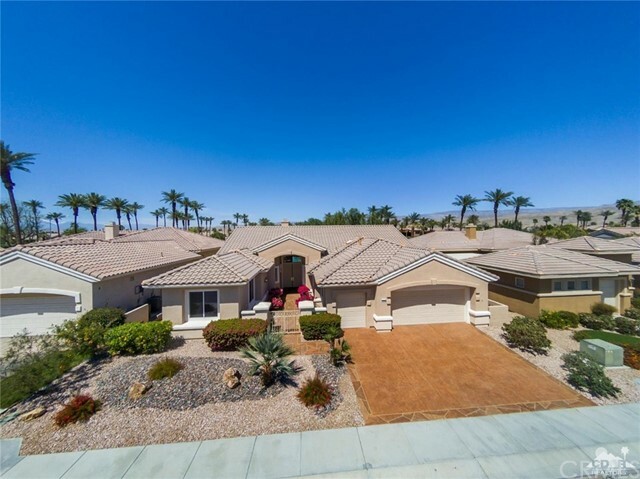 In the activity galore 55+ community of Sun City, PD awaits this Grand Portofino estate model home. Sitting on an elevated lot overlooking the golf course and fabulous panoramic south-facing mountain views, this 2749 Sq. Ft is truly MOVE in Ready. 3 CAR GARAGE including Golf Cart. Guarded 24 Hour Gate.The master suit has it all, jetted soaking tub, separate walk-in shower, 2 large walk-in closets, sitting room/office & patio with private Spa, plus 2 additional en suites. Chef's kitchen with entertaining bar, great room concept with family room, breakfast with an open pallet, freshly painted throughout, All Brand New Appliances, washer & dryer all included, new carpet & newer tiles. Plus a formal dining & living room, 2 fireplaces, LOW HOA & much more." "Sun City Palm Desert- Solitaire (Remodeled & Upgraded). Sitting elevated above the golf course this home has an east facing rear yard w/a pebbletec pool & spa w/stone spillover; an electric awnings & panoramic views. There is curb appeal w/stacked stone facade, & a wrought iron gate leading to a courtyard & double door entry. Inside, there are 12ft coffered ceilings in the greatroom (w/crown molding) & foyer (w/uplighting). Shutters are on most windows. Engineered cherry wood flooring is in all but the baths & laundry. The wall was partially removed opening the kitchen to the greatroom. The kitchen has slab granite counters, glass tile backsplash, stainless appliances & upgraded cabinetry. The master suite has a private courtyard & large walk-in closet w/builtin storage. Granite counters, upgraded fixtures & rimless glass enclosures are in both baths. The laundry has abundant cabinetry, utility sink & granite counter. The home has newer HVAC. The 2+ golf cart garage has an epoxy floor." "Sun City Palm Desert- Monterey. Simply Wow! Upgrades. Views. Floorplan. This prized greatroom home looks down the 16th fairway providing panoramic mountain views culminating w/the peak of Mt. San Jacinto. 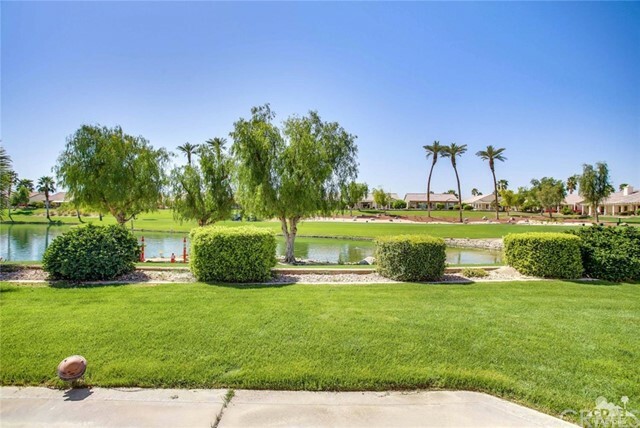 The spacious rear yard has an extended patio, low maintenance desert landscaping & no golf ball or cart annoyances. Inside, rectified Italian wood-like tile is in all but the bedrooms & den. Shutters are on all non-view windows. The kitchen features stunning Carrara marble counters (slab) & backsplash (tile), Swarovski crystal pendant lighting, a Kohler sound absorption stainless sink & John Boos maple butcher block. The greatroom has a custom builtin media center. The master suite has a large walkin closet. The master bath has dual sinks, a stall shower, large tub & cultured marble surfaces. The guest ensuite has mountain views & a stall shower in its bathroom. The powder room has upgraded fixtures & lighting. The laundry room has builtin storage. Some furniture avail outside escrow." 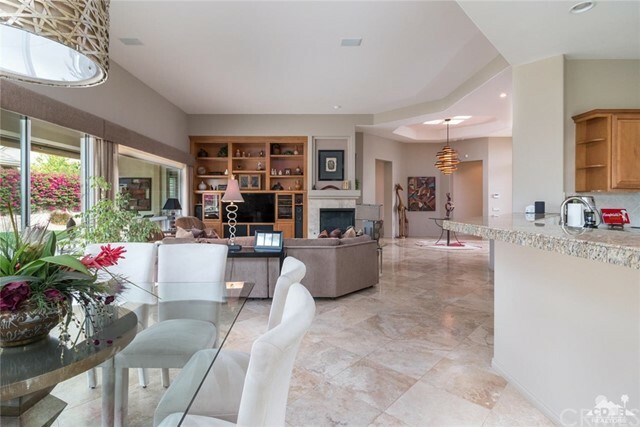 "Sun City Palm Desert: Fantastic VIEWS from this great room Victoria floor plan home on a premium greenbelt lot with VIEWS of the lake, greenbelt and mountains. The gourmet kitchen has a center island, granite counters with full back splash, wall ovens, gas cook top. Breakfast nook and formal dining room. The great room with built in entertainment center has a massive wall of windows providing unobstructed VIEWS. Den/office with built in desk and storage. The large master bedroom has a bay window with northern VIEWS. The master bath has dual sinks, stall shower and separate soaking tub. Plus large walk in closet. The guest bedroom is in the front of the home with an adjacent full bath. Guest powder room. Expanded laundry room with storage cabinets and desk and/or folding area for laundry. Extended two car garage with air conditioner." "Sun City Palm Desert-Portofino. Upgraded estate model home sits on a very private, fabulous pie shaped lot. Spacious south facing rear yard features salt-water, pebble Tec pool, separate in-ground spa, BBQ island, & granite gas fire pit. Bocce court in rear yard, plus 8 citrus trees. A gated courtyard & double leaded glass doors provide curb appeal. Inside, 12ft ceilings in living room & foyer. A 2-sided fireplace sits between living & family rooms. Shutters & silhouettes throughout. Large formal dining has an octagon shaped coffered ceiling. Kitchen has slab granite counters, double wall ovens, under cabinet lighting, & cherry wood cabinets. Master suite has his & hers walk in closets & private retreat w/infrared sauna & office. Master bath has dual sinks, stall shower & over-sized tub. 2 guest suites on opposite sides of home, each with stall shower in its bathroom. Home has an extended 2+ golf cart garage & central vac." "Sun City Palm Desert- Monaco. This estate model home sits on west facing lot with breathtaking views of Mt. San Jacinto & Mt. San Gorgonio. 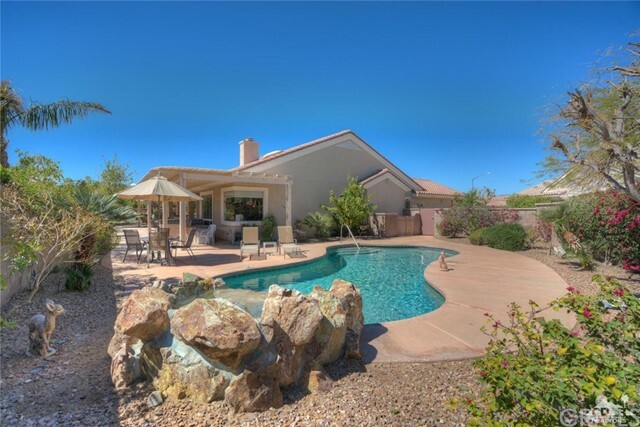 The spacious rear yard features an expanded patio, alumawood patio cover & desert landscaping. A gated courtyard & leaded glass French doors provide curb appeal. Inside, 18in diagonally laid tile in all but the bedrooms. Shutter on most windows. 12ft ceilings are in the foyer & greatroom which has a fireplace & double slider to the patio. The kitchen has corian counters, under cabinet lighting, dual wall ovens & a skylight. Raised panel cabinetry is in the kitchen, bathrooms & laundry. The family room has a custom builtin media center. The extended master suite has a slider to the rear patio & large walkin closet. The master bath has dual sinks, large tub & stall shower. The extended guest suite has French doors to the courtyard. The 2nd guest suite provide a total of 3 bedrooms & 3 full bathrooms. The 2+ golf cart garage is extended." "Sun City Palm Desert- Morocco w/casita. Location. Floorplan. Upgrades. Sitting over a greenbelt lake this home has an east facing rear yard w/a spacious patio, pebbletec spa, electric awning & misting system. A gated courtyard w/water feature & misters provides curb appeal & function. Inside, the main house there are 2 full suites & a powder room. Diagonally laid travertine tile is in all but the bedrooms. Custom builtins are in the greatroom (media) & den/office (cabinets/desk). The kitchen has slab granite counters, stainless appliances & cabinets w/pullout shelves. The master suite has a bay window & large walkin closet w/builtin storage. The master bath has dual sinks, a stall shower w/rimless glass enclosure & large tub. Stone surfaces in the master, guest and powder baths. The extended 2 car garage has a golf cart nook, builtin storage & AC. Home has central vac, wired for home audio. Furniture available outside escrow; some exclusions." "Superb St. Tropez great room model mirrors your lifestyle! 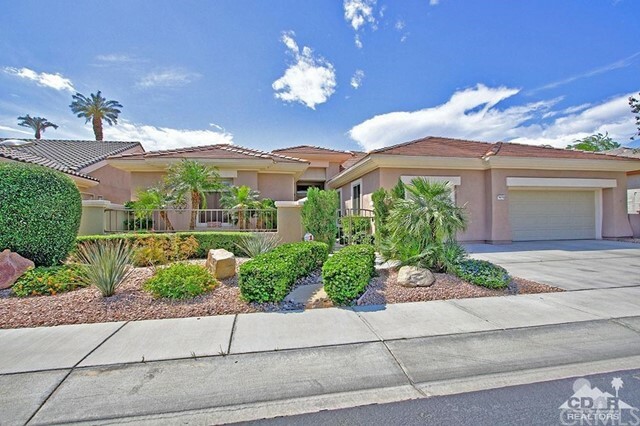 Highly desirable Sun City Palm Desert home with 2 suites, den and powder room. Entertainer's delight with seamless indoor and outdoor living. Double glass doors lead to welcoming open floor plan with expansive windows framing the private backyard. From tiled foyer, a natural gathering spot is the bar area with granite counters, custom cabinets, sink, refrigerator with ice maker. Relax in the great room with media wall, fireplace, sliding doors to backyard. Extra-large lot with waterfall spa, built-in BBQ, firepit, citrus trees, plus space for your personal touches. Covered outdoor sitting area with retractable awning. Re-enter via breakfast nook door into grand kitchen with granite island, counters, breakfast bar, pullout shelves, skylight. Master suite with upgraded bathroom, soaking tub, step in shower, marble counters, double vanities, custom closet. Quiet cul-de-sac location. Extended 2 car plus golf cart garage." "Magnificent Golf Course Home: A unique upgraded Monterey plan with golf & lake views. All the following custom features make this a property of distinction: Limestone flooring, stone fireplace mantel, entertainment cabinetry, library cabinetry, bathroom tiled floors, splashes & shower, office cabinetry, Outdoor Kitchen with sink, plantation shutters in the right locations, granite kitchen counters, a built-in wine cooler & crown molding in every room. A large master bedroom suite with French doors to rear patio, a second master guest suite, a separate dinning area & a morning room with wrap-around windows with golf gorgeous views. Other features include a custom half wall added in the entry, an office with built-ins and lovely lighting fixtures give this home a unique ambience. All features fitting seamlessly together to provide a wonderful quality of life. 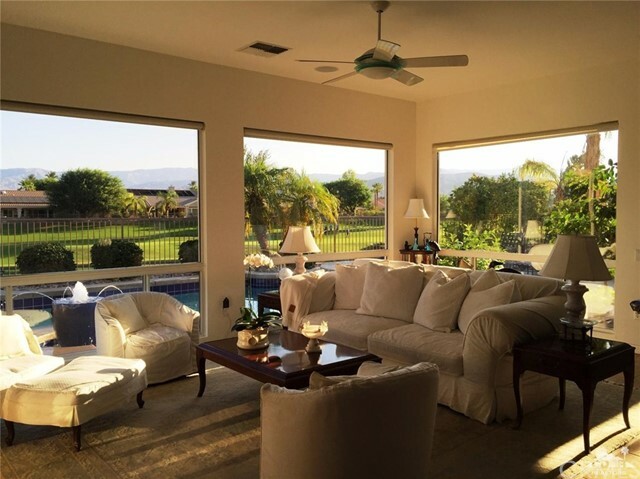 This exceptional property compliments the vibrant social life available in Sun City Palm Desert. Please view Virtual Tour." 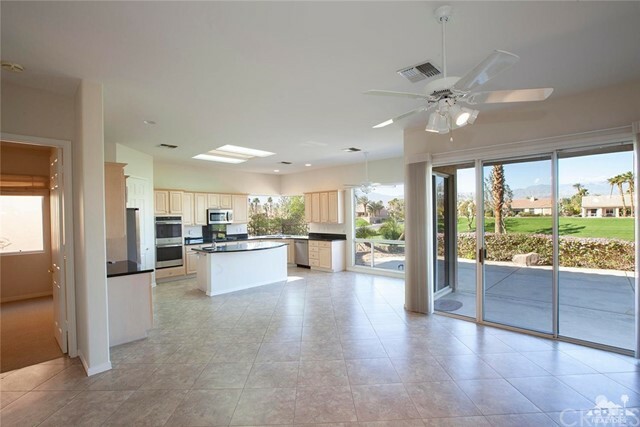 "Popular St. Croix model in Sun City Palm Desert. West facing rear patio with mountain, golf course and lake/pond views. In the front of the house, there is a private fenced and gated courtyard, perfect for morning coffee. This attractive and well-maintained home boasts a open and spacious kitchen with a tile floor, granite counters, a breakfast bar and a large breakfast nook. The Master Suite is spacious with a bay window, walk-in closet and ensuite bathroom, with two sinks, a walk-in shower and a separate spa tub. There is also a large second bedroom and a two-room den (with its own access to the garage) that could be used as an office, hobby room or optional third bedroom. The home has an extended 2 car garage and a separate golf car garage, with an epoxy coated floor and built-in storage. Furniture available outside of escrow. 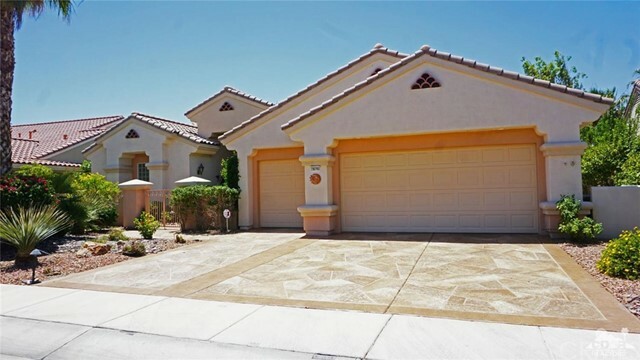 All this in the 55+ guard gated Sun City community, with 2 regulation golf courses, 3 clubhouses, over 60 chartered clubs and much more." 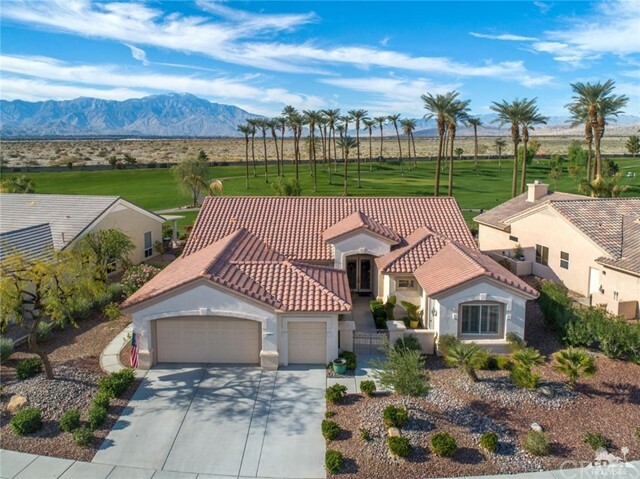 "Professionally designed STUNNING fairway home in Sun City Palm Desert, the deserts premier 55+ community! Here you have one of the most sophisticated and up to date homes yet! 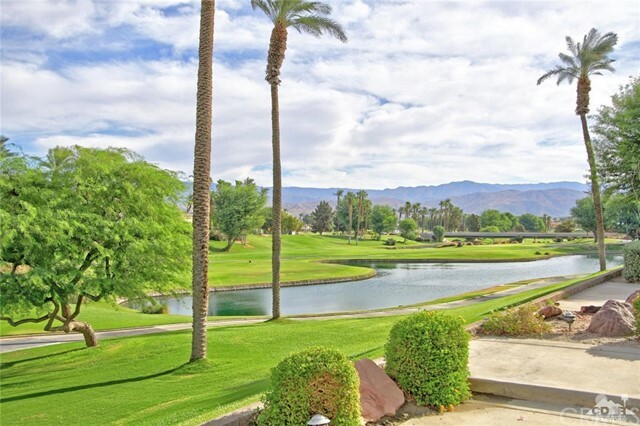 Enjoy living at its best with sweeping views of the fairway and mountains beyond. Walk to the clubhouse for actives and a bite to eat! To bring this home to the finest level of perfection, everything has been redone! Walking up to the double door entry you are greeted with new glass doors, new paint inside and out, new large tile throughout the entire home, new fixtures and hardware, and a completely redesigned floor plan. The gourmet kitchen is designed with a new configuration of custom cabinetry and floating shelves, quartz countertops, a huge eat at island enjoying amazing views, and the finest in new kitchen appliances. Wait until you see the new bathrooms! The master bath provides you with luxurious spa qualities every day; a huge floor level walk in rainfall shower, and all new cabinetry. Come see!" 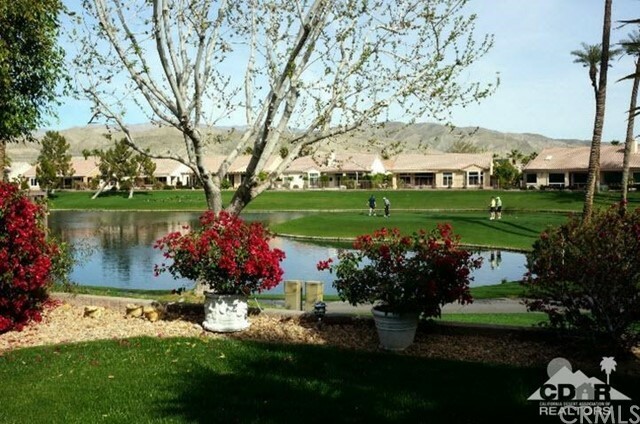 "Sun City Palm Desert; San Remo Model In The Newer Section Of Sun City, South Facing On The Golf Course. This Home Has A Large Master Suite With A Bay Window Overlooking The Golf Course Large Master Bath & Huge Walk In Closet. There Are 2 Guest Suites & 2.5 Baths. The Chef's Kitchen Has Granite Counters, Upgraded Raised Panel Cabinets, Top Of The Line Appliances, A Side Bar, Lots Of Cabinets, And A Large Pantry. The Flow In This Home Is Great Form The Grand Entry With Vaulted Ceilings, Formal Dining Room Large Family Room With A Fireplace And Formal Living Room. The Extended Covered Patio Has Custom Stamped Concrete Finishes As Does The Driveway And Front Courtyard. There Is A Separate Laundry Room, 2 Car Garage Plus A Golf Cart Garage"
"Desirable San Remo plan on an elevated lot with panoramic mountain, lake and golf course views. Impeccably maintained, this plan features 3 bedrooms and 2 1/2 baths. There is a large family room with a cozy fireplace and custom built-ins. The adjoining kitchen features an abundance of cabinets, breakfast bar and large pantry. Excellent for entertaining with a large living and separate formal dining area. The master bedroom has views of the golf course and the master bath offers dual sinks, a large shower and oversized tub. Guest bedrooms are on the opposite side of the house. Some of the other upgrades include plantation shutters, custom window coverings, tile floors set on the diagonal added lighting and ceiling fans. Large garage with a third space for a golf cart. 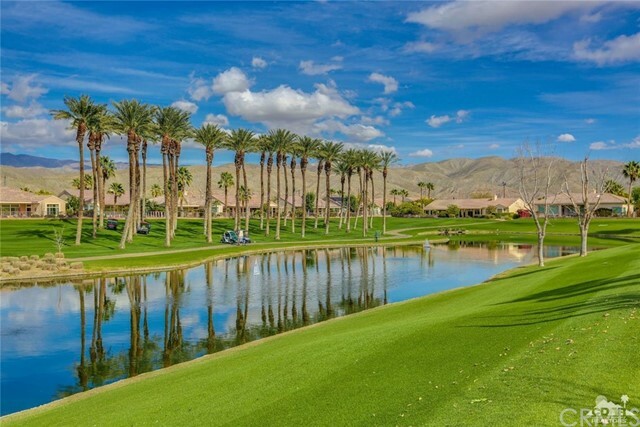 Guard-gated Sun City offers all the best of Palm Desert living with amenities including two 18- hole golf courses, 3 clubhouses, fitness centers, restaurants, pools, spas, tennis and more. Incredibly low monthly dues!" "Beautiful 3 bedroom, 3 bathrooms 2,155 SF Emerald Model similar to the Monaco. Inviting patio with North West double fairway views of the Snow capped Mountains. Master bedroom off of the patio with sought after golf course views. Front courtyard entry, Shutters throughout the home, Formal living & dining room with Separate family room with fireplace and casual dining room open to the gourmet kitchen. Corian counters stainless steel appliance with a large, inviting island make this the perfect full time residence tor Desert getaway. 2 large bedrooms with smaller guest room or office. Exterior of home was just freshly painted. 2 car garage plus additional golf cart garage. Offered furnished. Just a a Short golf cart drive to the Mountain View Clubhouse. Come and enjoy everything the Del Webb Sun City lifestyle has to offer." "Sun City Palm Desert- Marquis w/casita. 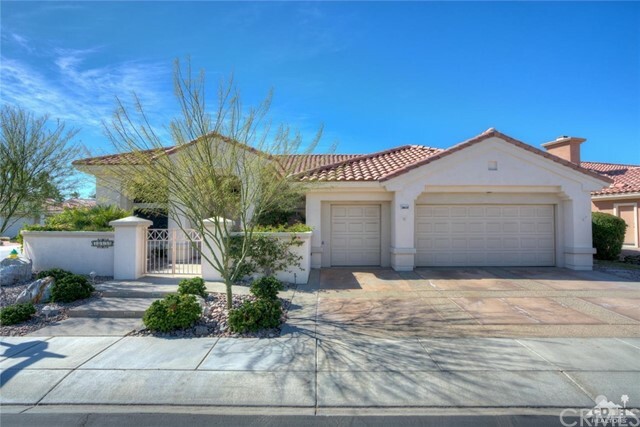 Sitting on a corner lot w/convenient access to the Mountain View clubhouse & main gate, this estate model home is a rare find with a detached casita in the spacious entertainer's rear yard w/BBQ island & bar, aggregate concrete patio & lush landscaping. A gated courtyard, double door entry & aggregate concrete provide curb appeal. Meticulously maintained inside and out. 12ft coffered ceilings are in the dining room & foyer (w/uplighting). Shutters are throughout. A fireplace is in the family room. The kitchen has abundant cabinetry w/pullout shelves, slab granite counters & stainless appliances including double ovens. A towering skylight leads to the master suite w/coffered ceilings, a bay slider to the rear patio & huge walkin closet w/builtin storage. The master bath has dual sinks, a stall shower & oversized spa tub. The large laundry room has abundant cabinetry & a utility sink. The 2+ golf cart garage has room for ample storage." "Sun City Palm Desert-St. Croix. Location! Location! Location! This home's south facing rear yard sits high above multiple fairways providing panoramic views & exceptional privacy. The extended stamped concrete patio provides abundant room for entertaining & features an elegant water feature. A gated front courtyard w/stamped concrete hardscpape & leaded glass front door provides curb appeal. Inside, tile flooring is used extensively. Almost all windows have been upgraded/replaced. The greatroom features a fireplace w/custom built-ins to each side. The den & hobby room each have custom built-ins. The kitchen features slab granite counters, under cabinet lighting & cabinets w/pullout shelves. The master suite has shutters, a door to the patio, a large walk in closet & pocket door to the master bath which has dual sinks & a stall shower. A tub is in the guest bath. The laundry room has abundant storage & a utility sink. The 2+ golf cart garage has built-in storage."